Each product redesign offers engineers a fresh opportunity to break with convention. But with deadlines looming, they can often feel pushed to re-purpose an existing Bill-of-Materials (BOM) and just tweak critical features. Armed with hard data about the consequences of their material choices, however, design engineers can make timelier, profit-driven decisions up-front in the redesign process. This was the experience of Justin Griffin, an R&D mechanical engineer at IDEXX Laboratories of Westbrook, Maine. Asked to redesign their blood chemistry analyzer, he found a subassembly with a main sheet-metal panel, 183 parts, and 63 fasteners—each with its own torque-spec and an assembly process that required a worker to both tighten and mark it. "This very traditional and now outdated system was just ripe for improvement," says Griffin. The instrument being scrutinized by Griffin was the Catalyst Dx® Chemistry Analyzer, a flagship product in IDEXX's industry-leading portfolio for the veterinary market. The redesign goals included significantly upgraded functionality as well as a twenty-percent cost cut, decreased weight and assembly time, and improvements in service and warranty. Griffin had a hunch that the redesign would involve a change of materials. "I suspected that plastic parts were going to play a huge role in our new approach," he says. "But I needed to back that up with some hard facts." To provide data about design changes and material choices, Griffin employed Design for Manufacture and Assembly (DFMA) software from Boothroyd Dewhurst of Wakefield, RI. He had never used the tool, but a recently-hired VP of Research and Development at IDEXX, familiar with the software, insisted on its adoption throughout the entire engineering organization. "When we began, we brought an engineer in from Boothroyd Dewhurst and meticulously went through the old MAD assembly," says Griffin. "The software asked a lot of questions about the design. It asked us to analyze every piece. In the end, we came up with three alternates and decided to go for the most ambitious change." To facilitate product development, DFMA provides a two-pronged approach. The Design for Assembly (DFA) module leads the engineer down a quantifiable path of parts consolidation and assembly simplification. "The software methodically guides you towards designs that have fewer parts and lower costs," says Griffin. "It forces you to answer questions that you might not have otherwise asked, like, 'Does this part move relative to this neighboring part?' or, 'Why don’t you use a snap feature instead of a screw?'" The Design for Manufacture (DFM) module complements DFA by systematically examining manufacturing processes and material choices, again using a series of queries and reports. "It asks you about every detail," says Griffin, "generating questions such as, 'Could this part be manufactured from a different material?' or, "Should this part be stamped, molded, or machined?'" As a result of this methodology, cost estimates and comparisons are available early in product development, and the resulting designs are "lean-from-the-start." "DFMA does an excellent job of providing a structured and measurable approach to scoring designs," says Griffin. "It forces you to think differently about your product." DFMA also pushes you to repeatedly reexamine your design during the analysis process. "The software gave me information such as which parts could be consolidated or which ones were candidates for elimination," Griffin says. "So I would go back to the design and revise it." After six or seven iterations and incremental improvements at each stage, Griffin settled on a new subassembly. As Griffin had predicted, an important result of the DFMA redesign was the identification of injection-molded plastics as the best substitute for sheet metal and assorted fasteners. "Plastics give you the flexibility to mold in a lot of features at relatively low cost," says Griffin. "Snap and slip fits, for example, eliminate fasteners and reduce the weight of the assembly. Plastics can also provide excellent durability and can even eliminate lubrication in moving parts if the correct material is chosen." Griffin chose Lubriloy®—a highly-durable self-lubricating compound—as the workhorse of the subassembly’s operational system. This material was picked because certain parts needed to be dimensionally stable while able to withstand years of use with sliding doors and moveable fits that contacted the remaining sheet metal parts. Next, he selected polycarbonate for its hard, opaque attributes and used it as a light block for a photosensitive detector; its resistance to chipping or deformation was important, since nicks or edges could generate false optical signals. A third plastic, ABS, was used for structural parts because of its stability and low cost. Working with these materials, Griffin was able to take the 43-part main panel of the subassembly and redesign it as a single injection-molded piece that included snap fits for the circuit board, a snap-fitted motor mount, and a molded-in rack for a damper gear (see Figure 2). 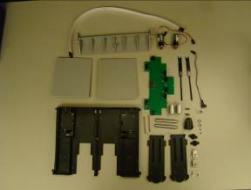 For another component (two identical moving doors), he was able to consolidate 30 parts into four, also by switching to plastic (see Figure 3). Benchmarking the redesign and comparing it with the original design, the results were dramatic: parts were reduced 83 percent; time to assemble was cut 75 percent; weight was lowered 40 percent; and the cost of assembly was reduced 38 percent. From a service and warranty standpoint, out-of-box failures caused by hardware not having proper torque (which were rare to begin with) were completely eliminated now that all the hardware was removed (see Figures 4 and 5 below). "We designed out all of the fasteners that you had to put a wrench or screwdriver on," says Griffin. "Some of the non-technical members of the team couldn’t understand how the unit could stay together without screws and nuts. There was quite a WOW factor!" Important in the manufacture of the new MAD subassembly were relationships with two suppliers: an assembler in Massachusetts and a plastics molding house in Connecticut. And while DFMA had given Griffin a window into cost-saving design features, it also gave the IDEXX team an inside view of the suppliers’ challenges and costs. Designers of molded parts, according to Griffin, often look at designs and do calculations in their heads based on experience about shot size, cooling times, energy expenditure, mold-making, tooling, and other factors. "They do it intuitively," he adds. "Very few quantify their thinking." But DFMA quantified all of those factors. So when the purchasing team approached the molder, they were prepared with specific information about materials, processes, and tooling. "DFMA told us things like how big the shot size is, how much time it’s going to take to cool, and how much it’s going to cost to build a mold," says Griffin. “Our numbers were pretty close to theirs, so the molder knew that we understood.” With the assembler the story was the same. And rather than being protective of their intellectual property, the two suppliers were receptive—even excited—to be having these sorts of conversations. With both the mold house and the assembler, DFMA served as a catalyst for collaboration. 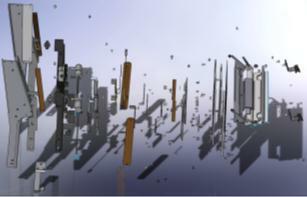 The result was targeted discussions about materials, processes, setup, labor, and volume. By focusing supplier conversations on topics other than margins and profits, negotiations became much more productive. "Demanding lower prices from suppliers just isn’t as effective as demonstrating that you understand their costs," Griffin says. "Purchasing now has the ability to ask pointed questions of suppliers and knows where the costs are coming from. DFMA has fundamentally changed the way we communicate with our outside partners." Beyond the instant gratification of achieving all of the specific redesign goals for the Catalyst Dx—parts consolidation, assembly simplification, cost reduction, and warranty and service improvement—many other benefits for IDEXX have come along with a DFMA-guided design process. For one, supplier relationships are now a win-win. Also, MRP/ERP for the Catalyst has been streamlined because there are now significantly fewer parts to track and control. Looking forward, the most significant benefit might be a shift in the engineering culture of the company. "DFMA drives us to go back to the drawing board and find opportunities to improve our designs," says Griffin. "We’ve adopted it into our process flow. A DFMA review is now required for every design project." And on a lighter (yet not to be taken lightly) side, Griffin adds, "In engineering, we’ve turned DFMA into a contest for the highest DFMA score, and ultimately better designs. It’s actually fun!" And what could be better for engineering creativity and productivity than that? 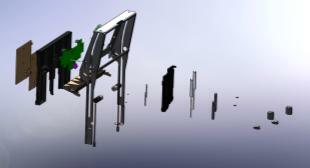 The original MAD subassembly with 63 fasteners and 183 total parts (top left and right) was redesigned using DFMA software. Parts consolidation and material substitution in the redesigned subassembly (bottom left and right) resulted in a total part count of 31 and the elimination of all fasteners. The DFMA scorecard for the original and redesigned Catalyst Dx MAD subassembly illustrates dramatic changes in part count, assembly time, and cost reduction. Note the elimination of Out-of-Box Failures (OBF), resulting from the switch from sheet metal to injection-molded plastic, and the removal of all fasteners. Note. Catalyst Dx is a registered trademark of IDEXX Laboratories, Inc. in the United States and other countries. All images belong to and were used with permission of IDEXX Laboratories, Inc. The IDEXX Catalyst Dx® Chemistry Analyzer with the Maintenance Access Door (MAD) in the open position. 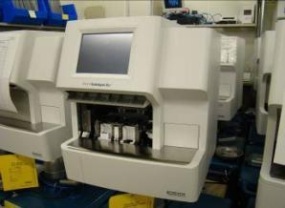 The MAD allows veterinarians to insert sample slides and self-service the instrument. 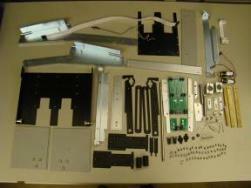 The subassembly was redesigned using DFMA software, dramatically cutting the number of parts, reducing assembly time, and decreasing product cost. The MAD subassembly main panel with fasteners (43 parts total) was fabricated from sheet metal in the original design (top). Following a DFMA-guided redesign, the panel was manufactured as a single injection-molded piece (bottom), with a variety of snap and slip features molded into the panel. Two sliding door components in the MAD subassembly had their part counts reduced from 30 to four, following a DFMA analysis that guided the design toward the use of injection-molded plastic rather than sheet metal.